Kyle is 10-years-old and has X-Linked ED but he doesn’t let that stop him from playing sports! Like most Canadian kids, he is a hockey fan and plays in nets as a goalie. He also plays baseball and soccer. 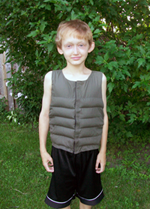 This vest swells up in water and keeps him cool while he plays. His mother Kim says it works so well at keeping Kyle cool, he can play without her worrying and without having to squirt water on Kyle all though a game. Make your own vest: Kim bought a few of the head bands that have the beads in them (the ones that swell up in the water and stay cool for hours). She brought them to a seamstress and asked her to sew the beads into a vest. Kim says the head bands with these beads are available online, and several different kinds are on the market. If you have any questions on the vest, or tips on staying cool while playing sports, Kim has offered to answer your questions through CEDSA. Good luck in the 2011 sports season, Kyle!